Hearing Evaluations, Consultation and Demonstration. A diagnostic hearing evaluation is the first step in determining your hearing capability. If you have a hearing loss, it will detail the extent, type, and specifics of your particular hearing loss. 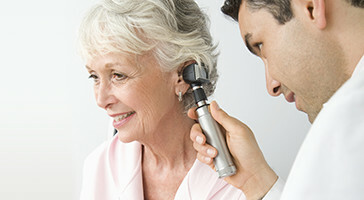 The diagnostic hearing evaluation will be performed by our audiologist. Diagnostic hearing evaluations identify hearing loss, and give our doctors of audiology important information to help determine the best course of action for treatment. Some types of hearing loss can be treated medically or surgically, so it's important that these types of hearing losses be ruled out before hearing aids or other treatments are considered. If it is determined that you could benefit from hearing aids, the diagnostic hearing evaluation helps the audiologist know which hearing aids will be most appropriate for your needs. When you arrive for your hearing test at Helton Hearing Care, you will be greeted by our client care coordinator and asked to fill out several forms, including those that record your personal information, medical history and verify your insurance. You will also have to read and acknowledge a Notice of Privacy as mandated by law. As your exam begins, our doctor of audiology will review your personal information with you and will ask you some questions that are designed to discover the specific types of environments in which you may be experiencing some difficulty in hearing. Make sure that you take a full list of any medications and supplements you are taking with you to your appointment. Next, the audiologist will look into your ears by using an otoscope. This instrument is used to see the ear canal and the ear drum and whether or not there is ear wax obstructing the canal. Sometimes the audiologist will have a video otoscope so you can see inside your ear as well. At Helton Hearing Care, hearing test is conducted in a soundproof booth, located in a soundproof testing suite. The process of testing is painless, comfortable and safe. The tests are performed using the latest technology of computerized audiometer. The audiologist will place headphones that are connected to an audiometer over your ears. The evaluation will probably last about 45 minutes to an hour in length. Following the tests, the audiologist will review the results with you and provide further recommendations, including treatment solutions. If the determination is made that you need hearing aids, allow for sufficient time to discuss your options. During the discussion, the audiologist may explain what sounds you are not hearing and what a hearing aid(s) can do to help. It is usually at this appointment that you will get to see and touch different styles of hearing aids. At Helton Hearing Care, we offer a wide range of hearing aid styles and technologies from a variety of leading manufacturers. To help our clients to hear what hearing technology sounds like, we offer a live demonstration by programming the hearing devices and put them in your ears, so you will be able to listen to a hearing aid and try it in our office. The audiologist will help you choose the best hearing aid(s) style, features and level of sophistication based on your degree of hearing loss, lifestyle, and financial circumstances. The final decision on which hearing aid(s) is purchased is your choice. We don't pressure clients to purchase or to make an immediate decision. To schedule an appointment with our doctors of audiology for a diagnostic hearing evaluation, call us today at (406) 586-0914.